The backbone of historical research, primary resources are the evidence on which modern understandings of the past are based. They pass on vital information about historical events and provide a firsthand record of what people thought, believed, or professed and how that affected their decision-making and actions. Encyclopedia of American Historical Documents is an exceptional, well-rounded, and insightful reference to many of the most significant documents in American history, from presidential speeches to cultural documents. 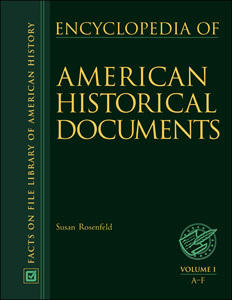 The natural companion to Facts On File's critically acclaimed 11-volume Encyclopedia of American History, this authoritative and broadly inclusive three-volume set provides not only the documents, but also concise background information about each document through informative introductions. This helps students place the works in their proper historical context while also providing a basic idea of the relevance of each document when it was issued and in the years that followed. A reference with multiple uses, students will gather from it interesting information about the documents, use the documents to defend their positions in classroom reports or debates, and quote from the documents to support their research in essays. Teachers will find its curriculum-based organization useful for developing lesson plans. Librarians and others will come to rely on it for quick reference. The documents are arranged chronologically to match the 10 eras outlined in the National Standards for United States History, and for each era approximately 50 to 60 documents, many of them full text, are presented. This means any user studying a particular era, such as the period defined by the Civil War and Reconstruction, will be able to browse through many documents that shed light on the time to get a wide perspective on the attitudes and events that shaped it. When users want to refer to a particular document, such as the Emancipation Proclamation, they can use the index to go directly to it or find it listed under the era from which it comes in the table of contents. In addition to important political documents, such as the Declaration of Independence and the Constitution, the collection includes key cultural documents, such as Ralph Waldo Emerson’s “American Scholar” speech and material from President Nixon’s visit with Elvis Presley. This comprehensive encyclopedia is a complete resource, providing selected sources for further research and a timeline to help readers place documents and events in chronological order. Students and teachers alike will find this set useful and will turn to it for all their research needs. Librarians will be proud to expand their American history collections to include this definitive work and point their users to a reliable source for historical documents. Discover how the Patriot Act was enacted after the terrorist attacks of September 11, 2001, and has since received scrutiny for its controversial aims. "Students and teachers will welcome this mammoth resource." "...a gem...This set is ideal for anyone of high school age or older with a keen interest in history, and would be a welcome addition to any library." "This collection is strongest for its inclusion of documents relevant to the contemporary world and documents from the current Bush administration...Recommended." "Users of high-school, public, and college libraries will benefit from the convenient access this new set gives to thought-provoking historical documents."